Adaptation. Why your success depends on it. Adapt, evolve, succeed. So, what do finches have to do with business success? 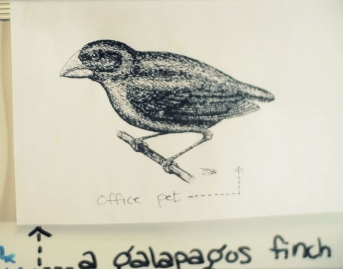 Darwin studied the finches of the Galapagos Islands carefully, and made predictions about their future adaptation and ability to succeed. What’s that got to do with your business? Plenty. In the last ten years, even the last five years, there have been profound, Darwinian changes in the behavior of decision makers, and the communications channels where buyer and seller might connect. A majority of companies have not fully embraced adaptation to these new realities such as the emergence of marketing automation or the power of social media. Have you? Have your competitors? Buyers are now in charge of all transactions, and they do not want to hear what you’re selling. Your prospects have learned to avoid sales pitches so thoroughly, it is less and less cost-effective every year to “push” any message that even resembles an ad. Response to print ads are in decline. They listen to iPods, not radio. DVRs, voice mail, spam filters prevent contact. Sure, ten years ago a consumer might have used the Yellow Pages, but nobody under 70 does today. Yes, a purchasing agent might have found you in a printed directory then, but today, if your website doesn’t come up on her smartphone, you can and will lose sales. We went from ad agency to branding agency, realizing that advertising is now just one tactic among many, not a cure-all. Adaptation demanded it: the communications mix is more complex than ever. Is your brand active on social networks, for example? Adaptation demands difficult changes and decisions. (We can help.) Call 312 836 0050. Tell us a little birdie sent you. *One example: on one Galapagos Island, 1020 of the 1200 native finches died off after a drought killed their normal food supply. The 180 who survived the drought (and only 12 were females) were the finches with slightly larger (0.39mm, 15/1000 of an inch larger!) beaks, who could break and eat seeds. They re-populated the island with offspring that were, not surprisingly, larger-beaked, and evolution was off at a gallop.